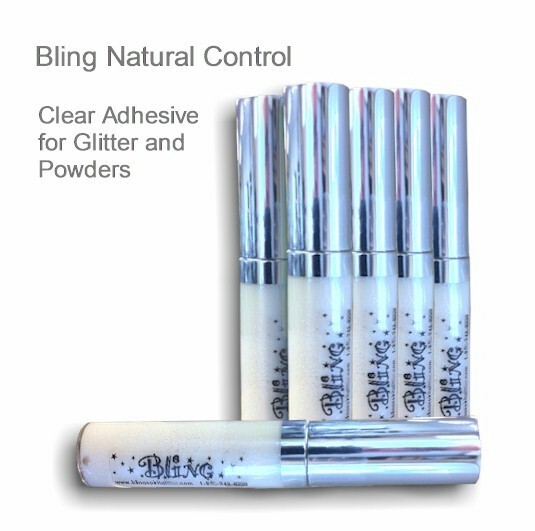 The Natural Control is an adhesive used with our Glitters, Powders, & or Mini Glitter Stars. Apply a thin layer for a long lasting adhesive for your favorite colors of eye shadow glitters. The Control is off white in the container; once applied it goes on clear with a faint iridescent to see where the control has been applied. Cheerleaders and Dance Teams love the Natural Control Adhesive it's not harsh on the eye and doesn’t irritate the skin. It has a max hold that lasts all day until you are ready to remove with warm water and cleanser or makeup remover. Use it with any Glitter, Powder & or Mini Glitter Stars. I have been looking for a glitter glue that I can stand to wear my friend told me to try this and I really LOVED IT. It wasn't sticky on the eye but held the glitter on. The last glue I used from another company I would have to keep my eyes closed for ever afterwards bc my eyelid would stick together at the crease. I would have to have help applying it bc it became a nightmare for me and I wanted to make sure everyone tries this. We first tried this at camp over the summer and liked it. It works great.